It’s not often I can start a review with the same words used by the performer I’ve just seen but WOW!!!!!!!!!!!!!!!! (yep, that’s 16 exclamation marks). I think that pretty much sums up my view of Elio Pace and his band who last night kicked off their 2015 tour of “The Billy Joel Songbook” at the Leicester Square Theatre. This is two that successfully combines two massive elements. The first is Mr Billy Joel, one of the most prolific and successful singer/songwriter’s ever seen. This guy is, not to point too fine a point on it, pretty damned impressive. When you look back at Billy’s career from his first album ‘Cold Spring Harbor’ released in 1971 to the present, there is not a single genre of commercial music where he has failed to shine. Ballads, pop, rock, acapella, solo, big band – you name it and Billy has produced a mega-successful single or album covering it. If that’s not enough, he also released a superb classical music album, ‘Fantasies and Delusions’ – which we got to hear a snippet of last night – in 2001. Prolific and never complacent in what he produces, Billy Joel proves that commercial success and quality can go hand in hand to produce record-breaking tracks that really stand the test of time. The second element to the show is Mr Elio Pace himself. A consummate performer who charmed and connected with his audience from the moment he stepped onto the stage to the strains of ‘Angry Young Man’ Elio is a constant pleasure to watch and hear. Together with his mega-talented band, Elio brings his love of Billy Joel’s work to every second of the show. There’s no flashy costumes, or dancing boys/girls – Elio was in a simple black suit, white shirt and black tie with the rest of the band suitably relaxed in their attire – because flashiness wasn’t necessary to convey the magic of the music and Billy’s story which Elio, who has obviously really researched his subject, gave us snippets of between some of the songs. I loved this providing, as it did, a wonderful glimpse into the life and mind of Billy – for example, he never wanted to release ‘Just the way you are’ which then went on to win two Grammy’s and spent 27 weeks in the US top 10. Whether you are currently a fan or not, “The Billy Joel Songbook” is a wonderful show. From the first moment, there were members of the audience bobbing their heads and singing along to the many familiar songs – got to say I surprised myself with how many lyrics I remembered and really wanted to join the boys on stage for ‘The longest Time’. After a first act with some fantastic songs including personal highlights such as ‘This Night’ and one I’d never heard before ‘Root Beer Rag’ – a test of piano playing that Elio passed with flying colours – I, like the rest of the audience, was calling for more. The Second act started with ‘Captain Jack’ and then had a superb segment dedicated to some of the most beautiful of Billy’s love songs – including ‘She Got Away’, ‘You’re My Home’ and the haunting ‘Lullaby (Goodnight, My Angel)’. Of course it was impossible to finish off with ‘soppy love songs’ so the final 20 minutes was a smorgasbord of awesome tracks guaranteed to get the entire audience on their feet and singing/dancing along – to be honest some of them had obviously wanted to do this right from the start. I, along with my companions, was up there doing the ‘Billy Joel Dance’ (step, back-cross, step, kick) during ‘Uptown Girl’ and completely messing up the order of the words in ‘We Didn’t Start the Fire’ as I sang and danced with everyone else. When the show finally finished – can’t think why they did, as Elio said there were still around 102 songs in the songbook to go – the roof of the theatre was seen to shake at the massive roar of appreciation from an audience that had been well and truly entertained. 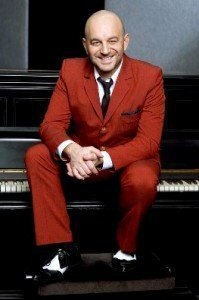 Elio Pace is taking “The Billy Joel Songbook” on a 50 show tour round the UK between now and November. My advice? Young or old, unless you are dead, get yourself along to one of the dates and lose yourself in a magical performance of totally awesome music, written by a genus and delivered by a truly amazing and talented band headed up by a fantastic singer. So, to end, and at the risk of repeating myself – WOW!!!!!!!!!!!!!!!! Returning by popular demand for a second year and following on from his highly-praised concerts in the USA starring with Billy Joel’s original 1971-72 touring band, Elio Pace delivers this sensational tour celebrating the phenomenal music of the 150 million record selling, multiple award winning, Billy Joel. Elio’s outstanding talent, energy and pure infectious passion for this ingenious songbook will have you enthralled from the moment his fingers strike the piano for the show’s opener, ‘Prelude/Angry Young Man’. As well as being interspersed with insightful and fascinating anecdotes, the show features over THIRTY of Billy Joel’s incredible songs including the massive hits, ‘Uptown Girl’, ‘Just The Way You Are’ and ‘My Life’ as well as fan favourites such as ‘Scenes From An Italian Restaurant’, ‘Goodnight Saigon’ and ‘Piano Man’.